Glaucoma is a leading cause of blindness in the United States. Glaucoma can affect patients of all ages. Known as the “sneak thief of sight”, many people affected with glaucoma do not experience any symptoms and may not be aware that they have the disease until they have lost a significant amount of vision. With early detection and treatment, eyes can be protected against the serious loss of vision or blindness. Glaucoma develops when the pressure inside the eye rises, damaging the optic nerve and causing vision loss. The condition often develops over many years without causing pain or other noticeable symptoms – so you may not experience vision loss until the disease has progressed. Medication, either as eye drops or oral medication, is used to either reduce fluid production in the front of the eye or to help drain excess fluid. Side effects of the medication may result in redness, stinging, irritation or blurry vision. Patients should advise their doctor about any medications they are taking or any allergies they have to minimize the risk of side effects. While glaucoma often has no symptoms, regular use of the medication is needed to keep the eye pressure under control. Surgery to create a new channel to drain fluid from the eye and reduce the pressure that causes glaucoma in a procedure known as trabeculectomy. Surgery is performed only after medication and laser procedures have been unsuccessful. 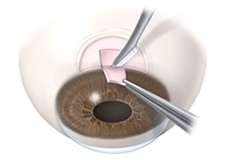 Glaucoma filter surgery, otherwise known as trabeculectomy, is one of the most common procedures used to treat open-angle and chronic closed-angle glaucoma. A new drainage passage is created by cutting a small hole in the sclera (the white part of the eye) and creating a collection pouch between the sclera and conjunctiva (the outer covering of the eye). This serves to create a system for bypassing the blocked drainage channels, encouraging fluid drainage and reducing eye pressure. 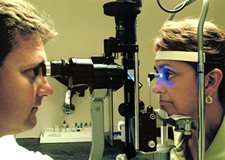 Glaucoma filter surgery is usually an outpatient procedure that does not require a hospital stay. Most patients only experience mild pain post-surgery. The treated eye must remain covered at night for several weeks after the procedure. In addition, patients will need to apply a corticosteroid to the eye to reduce swelling for up to two months. Activity will be somewhat limited for the first few weeks after glaucoma filter surgery, and your doctor will discuss your specific restrictions.